Grant Achatz professes his devotion to the 1970s’ favorite cooking gadget and shares three fantastic stews. In 2011, I gathered a small group of my chefs to brainstorm ideas for the upcoming “childhood” menu at my Chicago restaurant Next, where we come up with a whole new theme every few months. To jump-start the conversation, I asked a purposefully vague question: “What is childhood?” “Atari,” someone replied. “Legos,” called out someone else. “My grandmother’s pot roast in the Crock-Pot,” said a third. For me, and for a lot of people, slow cookers like the Crock-Pot are deeply evocative of childhood. Every Halloween when I was growing up, my mom made chili in her Crock-Pot. She started it around 1 p.m. and let it cook all day. My friends and cousins and I would play outside, and when we got chilly, we’d come in and have a cup to warm up. Then we’d put our costumes on and go out trick-or-treating. Later, if we got hungry while we were counting our candy, we’d have some more chili. There are distinct periods of American cooking, and the Crock-Pot years were seminal. Modern American chefs owe a debt to that mid-20th-century era. I love the romance of the Crock-Pot. It evokes a time in my life when cooking was wholesome andfamily-oriented, rather than focused on cutting-edge methods. Yet old-fashioned slow cooking and the modernist culinary technique of sous vide are essentially the same: cooking at a very low, controlled temperature, in a closed environment that traps all the vapor, aroma and flavor. 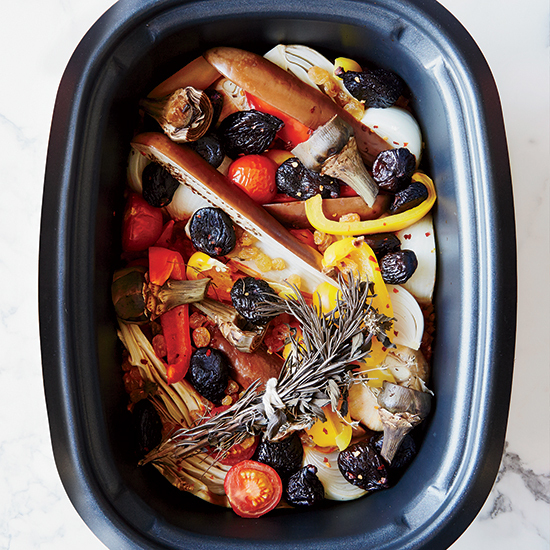 Slow cookers are incredibly versatile. I should know: I use them at home and I use them at my restaurants. I have become the Crock-Pot’s most unlikely champion. When I told my cooks at Alinea that we’d be serving paella in a slow cooker as one of our tasting menu’s 18 courses, there were a lot of raised eyebrows. But the slow cooker solves one of our biggest problems, which is that we never serve really hot food. Like most tasting-menu restaurants, we’re so consumed with presentation that the food cools in the time it takes to plate it. So in an 18-course menu, I like to do one family-style course, something that doesn’t need a team of 35 chefs with tweezers. That’s where the slow cooker comes in: We use the ceramic insert as the serving vessel. After 15 courses of intricate little plates, we plunk this big, steaming pot in the middle of the table with two spoons and say, “Serve yourself.” People love it. But paella is just the start. I’m constantly thinking about what’s going into the Crock-Pot next. Almost any dish that cooks slowly is fair game. A slow cooker can double as a bamboo steamer for making dumplings or buns, like the kind I had in Japan. I simply pour a little water or tea into the bottom of the insert, create a rack by layering lemongrass, sliced ginger or banana leaves on top of the liquid, and place the dumplings or buns on top. As they steam, they pick up the perfume of those aromatics. Or, I skip the liquid and simply put down a bed of chopped herbs and lay a piece of fish on it. The herbs release their moisture to slowly steam the fish. That’s a very useful technique for easy, healthy cooking. I’ve also used my slow cooker to make savory custards in the Chinese and Japanese tradition, things like chawan mushi. I just pour the custard mixture into the insert and set the machine on low. I could make British-style steamed puddings, South Indian chutneys and Hawaiian banana-leaf-wrapped pork. Pour a little liquid in the bottom of the pot, place the leaf-wrapped parcel inside and close the lid: It’s a one-pot dish. It’s extraordinary. The recipes on the next few pages are some of my favorites. The farro with tomatoes, eggplant, squash and dried fruit is an Italian vegetarian stew I make at home. The chicken “potpie” has a touch of Alinea’s deconstructionist whimsy. It’s a rich, slow-cooked chicken stew with bits of crushed crust sprinkled over it; at the last minute, poached eggs also go on top for a play on the which-came-first question. And my seafood gumbo is fairly close to the Creole classic. Just plug in the Crock-Pot and call yourself a modernist.